← H2O decreasing while CO2 rises ! Climate forcing relies on an imbalance between incoming solar energy and outgoing IR energy at the TOA (top of atmosphere). The CERES instruments monitor radiation fluxes at the TOA and has measured this imbalance over the last 11 years . Clouds remain a major uncertainty and large seasonal swings in the “imbalance” are clearly observed. However when averaged over 12 months there remains a small imbalance of about 0.6 +- 0.4 W/m2. 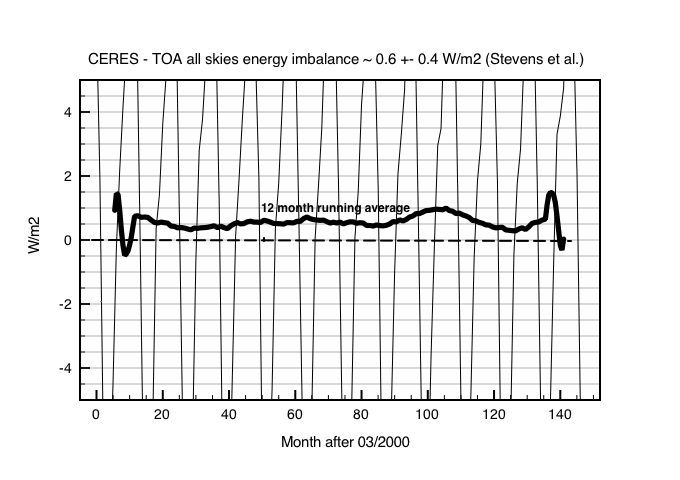 Figure 1 shows the CERES data for all skies from March 2000 to 2012 showing a net constant imbalance of about 0.5 W/m2. This value agrees with the paper by Stephens et al  which quote a TOA imbalance of 0.6 +- 0.4 W/m2. Where is this missing energy going ? Are the Earth’s oceans absorbing the extra energy and if so, how fast is ocean temperature rising ? Ocean heat content can be derived from the measured temperature profiles of the Earth’s oceans . The heat content is calculated by using the specific heat for a given depth/volume of water and the temperature change. Figure 2 shows the resultant OHC anomaly(change) for the top 700m of global oceans. For at least the last 12-40 years there has been an imbalance between incoming and outgoing radiation of ~0.6 W/m2 at the TOA. The measured heat content of the top 700m of the world’s oceans have apparently absorbed ~ 1.3×10**23 Joules of energy. The heat content of the oceans is equal to the heat capacity of salt water times the change in temperature integrated over the entire mass of oceans. The total area covered by oceans in Earth is about 3.6×10**14 m2, and the heat capacity of water is 4×10**3 Jkg-1K-1. So this increase in heat content corresponds to a net temperature rise in the top 700m of about 0.15C. Now lets see if the integrated TOA imbalance integrated over the oceans can explain this rise. 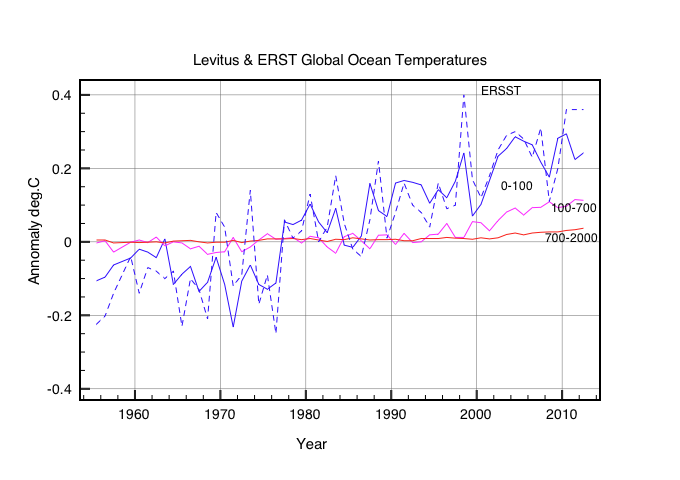 Fig3: Ocean temperatures derived from heat content. For comparison the ERSST surface measurements are shown. Assuming constant net TOA forcing since 1960, the total energy imbalance since then = 0.6*3.6*10**14*(no.of secs since 1960) = 3.4*10**23 (+- 2.3*10**23) joules. That is roughly 2.5 times greater the total ocean heat content (1.3*10**23 joules) but still just about compatible within errors. Land surfaces warm and cool diurnally and seasonally because they react fast to any changes in climate forcings. If the earth surface was 100% land then radiative energy would always remain in balance via corresponding increases or decreases in surface temperature. 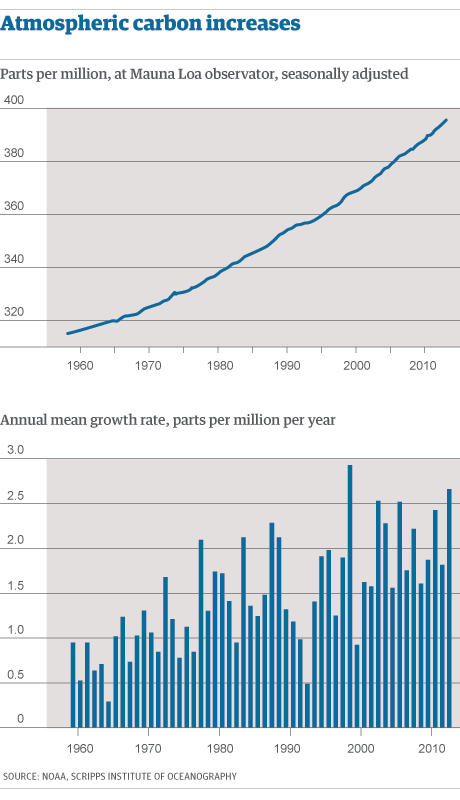 The oceans dampen out global temperature changes. What seems to have happened over the last 50 years is that the oceans have been slowly absorbing extra CO2 forcing through moderate temperature rises. Other factors including changes in cloud cover may also play a role in dampening energy balance. Fig 4 shows the atmospheric CO2 data since 1960. The extra CO2 forcing over this timeframe is predicted to be ~1.2 W/m2 (5.3ln(400/320)). Only about half that amount is now observed in the TOA energy balance, so the rest apparently has been absorbed by the oceans. CO2 forcing falls logarithmically with concentration so we would expect less absorption over the next 50 years even if emissions continue onwards at the same rate. The oceans would then take around a further 50 years to reach equilibrium . So if levels stabilize after ~2070 the total increase in sea surface temperatures should still be less than ~1C. 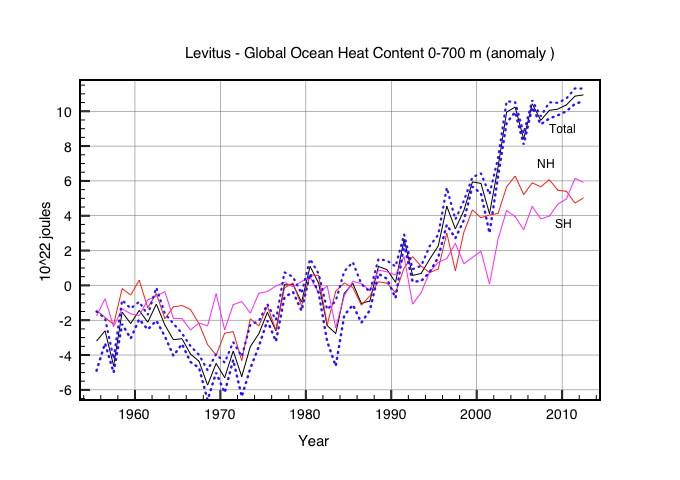 http://www.nodc.noaa.gov/OC5/3M_HEAT_CONTENT/index.html & Levitas et al GRL, 2002. This entry was posted in AGW, Climate Change, climate science, Science and tagged Climate Change, energy balance. Bookmark the permalink. It’s fine to say that CERES measures energy transmission at the TOA, provided CERES’ orbit is taken as the TOA. Given that, there are real geometric challenges to accurately model the energy leakage between CERES’ orbit and the Earth, i.e. the lateral transmission which misses the Earth. I have little faith that they’ve done it right. It needs auditing. That isn’t a realistic assumption. The TOA forcing in the 1960s might have be much smaller than in recent decades. Can you justify the assumption? I have now studied CERES published analysis and discovered that the imbalance of 0.6 w/m2 is fiddled to agree with climate models ! It is contrived and has no validity. I’ve been reading the famous David Mackay paper “Sustainable Energy Without The Hot Air” (SEWTHA) in which he says that there’s a layer in the oceans at about 400m depth that’s “virtually a solid wall.” Radioactive carbon from the atmospheric atom bomb tests of the 1950’s has penetrated this far and no further. Mackay’s argument is that all the CO2 absorbed by the oceans is concentrated in this top layer (leading to accelerated pH reduction), but it also implies that the missing heat cannot be hiding in the deep oceans. Yes – I found that statement in his book. Essentially there is zero mixing between the top layer 0-400m and the deep ocean. I agree that it is impossible to imagine how the missing heat could have reached 2000 m down just over the last 15 years ! It would also violates 2nd law of thermodynamics for heat to flow against a temperature gradient.